I’ve had a brilliant couple of days away in the West Country and its still only Sunday morning. On Friday I shopped in Glastonbury and on Saturday I was at Seriously Enchanted, the Assap conference on fairies, in Bristol. I’m going to be blogging more about those two things later, but what I want to talk about now is the film The Witch. 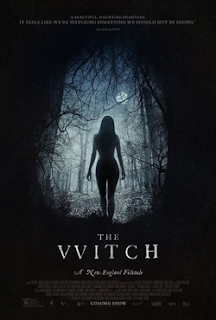 The Witch came out in cinemas in the UK on Friday and I was keen to see it as soon as I could because I had heard so much about it – primarily reviews by American audiences, as it was launched in the US first. The reports I had heard were mixed, some loved it, some hated it, some thought it was mediocre. The main thing that intrigued me was that I had heard that Pagans hated the film and Satanists loved it. It was even hailed as a great Satanist movie. I can see that The Witch could be described as a horror movie for Satanists in the same way that The Wicker Man (original version) was a horror movie for Pagans. Now I am not a Satanist, I am a Pagan, but I wasn’t in any way offended that this movie offers the historic view of witches as being people who have signed a pact with the Devil and do maleficent magic in his name. That was what was believed by New England Puritans at around the time of the Salem Witch Trials, which is when this film is set. It isn’t an account of the Witch Trials I would add – it is a purely fictional story, but one that draws heavily on historic accounts of witchcraft beliefs. I thought it was well done and I enjoyed it, although I would describe it more as tragedy than horror, because the movie wasn’t really that scary. It is about a family trying to scratch a living as farmers on their own out in the wilds and facing a series of disasters as winter approaches. They gradually start to suspect that these disasters are caused by witchcraft rather than natural forces, but (spoiler alert) the tragedy comes because they think the witch is one of them rather than a woman who lives in the forest on which their home borders – a woman they have no idea exists, but who has wicked intents. I’m not going to say how the movie concludes, but to me it felt inexorable and inevitable. I did feel that the film ended a little too quickly and too abruptly, but it wasn’t unsatisfying. I can certainly see why Satanists cheered. As a pagan, I wasn’t offended at all because this wasn’t an attempt at portraying modern pagan witches.